1. Toss the flour and paprika together in a shallow dish and add some seasoning, use this to coat the steak pieces. 2. Heat half the butter and oil in a frying pan over a high heat. Add the steak and stir-fry for 4–5 minutes, until sealed and lightly browned. Tip onto a plate and set aside. 5. Tip the sautéed beef with any juices back into the pan, then bring to the boil. Reduce the heat and simmer gently for about 5 minutes, until the sauce has reduced by half, stirring occasionally. 6. Stir the soured cream into the pan and return to the boil, then reduce the heat again and simmer gently for a couple of minutes, until the sauce has thickened and slightly reduced. 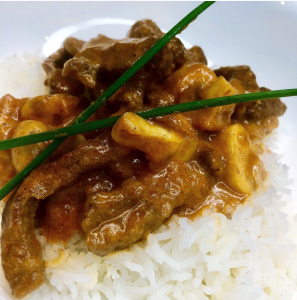 Divide the fluffy rice between warmed plates and spoon over the beef stroganoff. ENJOY!